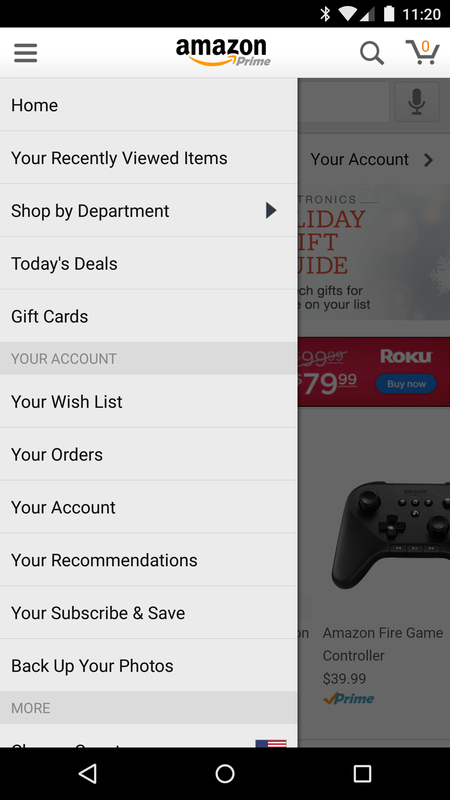 In case you weren't aware, Amazon updated its Android app a few weeks back with the ability to install other apps from its Appstore listings. This was part of the Instant Video rollout. 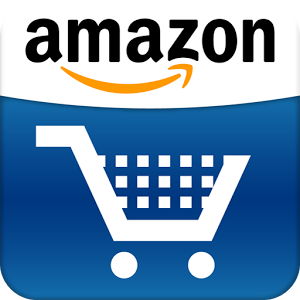 Google has rules against distributing app stores in Google Play, so it seemed odd to let Amazon get away with that. There's a German blog post that seems to confirm Google forced the change, but we don't know for sure what's going on yet. The new app has all the regular shopping tools, but the description lacks any mention of the Appstore. Looking at the navigation menu (see above) shows a lack of app and game listings. The new app has almost no downloads, though. It seems odd that Amazon would release a separate app rather than simply update the existing one (still listed on Amazon) to remove the Appstore feature, but here we are. Update: Amazon's supposed statement to the aforementioned blog says this is in response to a policy change in September, but that doesn't seem connected. That's when Google started requiring addresses for paid apps and those with IAPs. Amazon doesn't have either, and has a business address anyway. There were a few other changes as well, but none of them should have caused Amazon any issues. The only difference between the two apps appears to be the Appstore. We're still looking into this and have reached out to Amazon. Update 2: Amazon responded with the following. 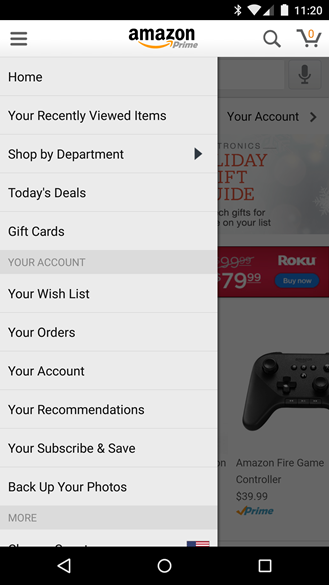 We launched a new Amazon App for Android Phones on September 9 that provides an award-winning mobile shopping experience, enables customers to discover and purchase all of Amazon’s digital catalog, and provides customers access to the Prime Instant Video player and unlimited streaming of over 40,000 movies and TV episodes. Google subsequently changed their Developer Distribution Agreement on September 25. 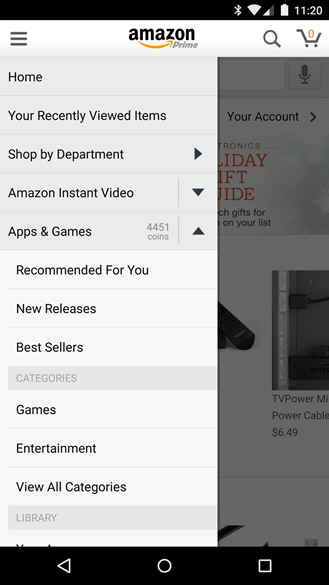 As a result, we removed the app from Google Play and published the Amazon Shopping app. Customers who want the best Amazon experience on their Android phone, including access to Prime Instant Video and Amazon’s entire digital catalog, can still get the Amazon App for Android Phones at amazon.com/androidapp. Okay, so again the September developer agreement change. We dug in, and here's what may be the relevant change. Prior to that change, section 4.5 read as follows. 4.5 Non-Compete. You may not use the Market to distribute or make available any Product whose primary purpose is to facilitate the distribution of software applications and games for use on Android devices outside of the Market. After the update (current rules), it says the following. 4.5 Alternative Stores. You may not use the Store to distribute or make available any Product which has a purpose that facilitates the distribution of software applications and games for use on Android devices outside of the Store. Let's zero in on the changes here. This section used to be called "Non-compete," but now it's just "Alternative Stores." The rules used to ban any app "whose primary purpose" was to distribute apps and games. After Amazon added the Appstore to its Android app, Google changed the text to ban any app "which has a purpose" of distributing apps. See? It used to only ban apps that were primarily app stores, but now it's anything with an app store, whether it's the primary purpose or not. You could make the argument that Amazon's Appstore was not the primary focus of the app when it was added in early September. Therefore, it was kind of okay. After the new dev agreement changed the language (or as Google says in the change summary provided "additional clarity") for third-party apps, Amazon couldn't make the argument that it was following the rules. I would wager this is also why Humble Bundle pulled its app recently. If this wasn't Amazon, Google probably would have just yanked the app, but I would assert that Mountain View made this subtle change specifically to shut Amazon down. There was probably some backroom lawyering over what the language meant, but in the end, Amazon decided to release a separate app in Google Play without the Appstore. All the digital content is still available in the version of the Amazon app available for sideloading on its website. tl;dr: Amazon probably got lawyered.